Anxiety Neurons Found In Brains : Shots - Health News Scientists who identified specific brain cells in mice that control anxiety say the discovery could provide insights that might eventually help people with panic disorder and social phobia. Scientists zeroed in on specific neurons in the brains of mice to gain insights into how anxiety is triggered and suppressed. "The therapies we have now have significant drawbacks," says Mazen Kheirbek, an assistant professor at the University of California, San Francisco and an author of the study. "This is another target that we can try to move the field forward for finding new therapies." But the research is at an early stage and lab findings in animals don't always pan out in humans. The discovery of anxiety cells is just the latest example of the "tremendous progress" scientists have made toward understanding how anxiety works in the brain, says Joshua Gordon, director of the National Institute of Mental Health, which helped fund the research. "If we can learn enough, we can develop the tools to turn on and off the key players that regulate anxiety in people," Gordon says. Anxiety disorders involve excessive worry that doesn't go away. These disorders include generalized anxiety disorder, panic disorder and social anxiety disorder. They did it by studying some anxious mice, Kheirbek says. "Mice tend to be afraid of open places," he says. So the team put mice in a maze in which some pathways led to open areas. Then the researchers monitored the activity of brain cells at the very bottom of the hippocampus. "And what we found is that these cells became more active whenever the animal went into an area that elicits anxiety," Kheirbek says. This activity didn't prove the cells were causing anxious behavior, though. So the team found a way to control the activity of these cells using a technique called optogenetics. "If we turn down this activity, will the animals become less anxious? And what we found was that they did become less anxious. They actually tended to want to explore the open arms of the maze even more." When the researchers dialed up the cells' activity, the mice got more anxious and didn't want to explore at all. 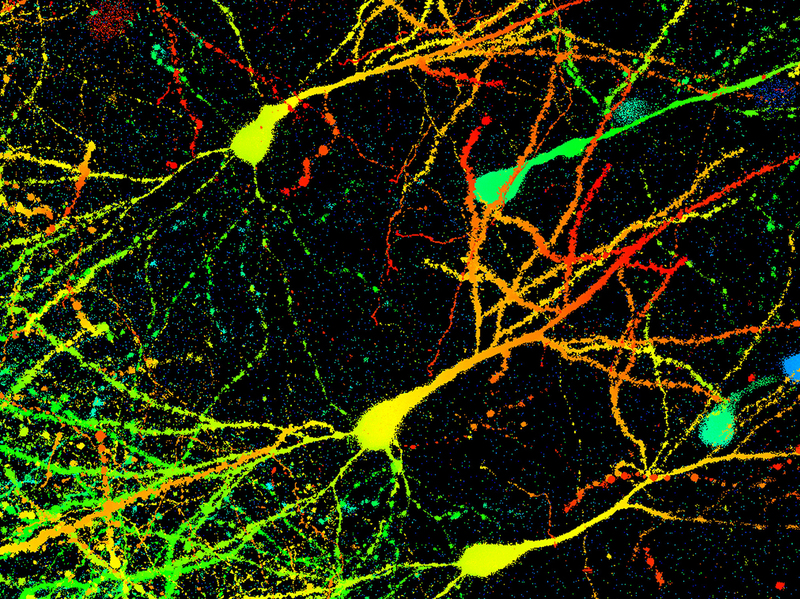 But there's a lot more to anxiety than just these cells in the hippocampus, Kheirbek says. "These cells are probably just one part of an extended circuit by which the animal learns about anxiety-related information." "You can think of this paper as one brick in a big wall," Gordon says. In recent years, he says, scientists have been finding and assembling other bricks at rapid pace. And they need to because anxiety disorders are "incredibly prevalent," Gordon says. "They hit us in the prime working years of life, and our treatments are, at best, partially efficacious."